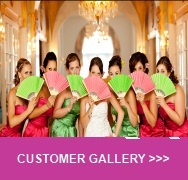 Promotional Fans - Paper Fans, Wedding Fans, Promotional Fans & Customised Hand Fans by Fantastica UK - Supplier of all types of plain and personalised hand fans for promotions, weddings and other special occasions. 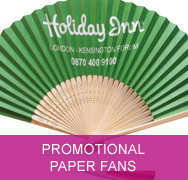 Promotional Hand Fans....There are few promotional items out there with as large an imprint area and as low a cost. 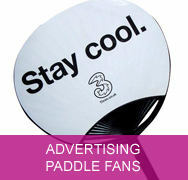 Our hand fans are available as promotional fans for company advertising purposes and consumer marketing campaigns. Not only are the fans memorable giveaways, they are also quite useful! 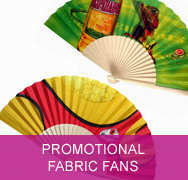 Promotional hand fans are well suited as promotional gifts & corporate giveaways, nightclub promotions, direct mail activites, outdoor events & festivals, seminars, training courses, sales campaigns and corporate parties. In fact, the ideas are endless and guaranteed to help people remember you and your special advertising message. Made from the highest quality of materials from paper, fabric or plastic we can print your artwork on one or both sides of the fan. 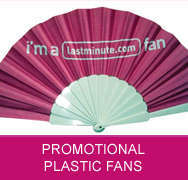 The lead time for promotional fans is up to 5 weeks depending on the order quantity. Our most busiest period is December to May. We recommend that you contact us prior to placing the order to obtain an accurate lead time. All Artwork must be provided in Adobe Illustrator format with fonts outlined. 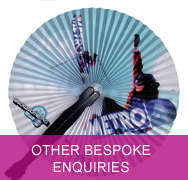 Once you have chosen your fan we will send over the relevant template to produce the artwork on. You will receive an email proof for final approval before full production commences. Please read our frequently asked questions section for more information on minimum order quantities and specific requirements. If you are a sales promotion or marketing agency please contact us for trade prices.